Last month, I wrote about KGameRenderer, the integrated rendering framework for 2D games which I’m creating for the 4.6 release* of kdegames. If you followed the relevant development mailing lists (kde-core-devel, kde-games-devel) lately, you know that the first version is mostly done and in the review phase. The productive atmosphere here in Tampere was the right opportunity for some benchmarking. I already knew from my experience that KGameRenderer-enabled games are faster, both in startup time and animation performance, than their counterparts using their own possibly suboptimal rendering code. There’s another question, though: Does a sophisticated, multi-layered image cache use more memory than the more primitive solution? The short answer: No, it uses less. The long answer: I have measured memory usage of the 4.5 KDiamond and the KGameRenderer-powered KDiamond in different scenarios (with cache, without cache etc.) and found that the KGameRenderer-powered version consistently uses ~1MB less memory. 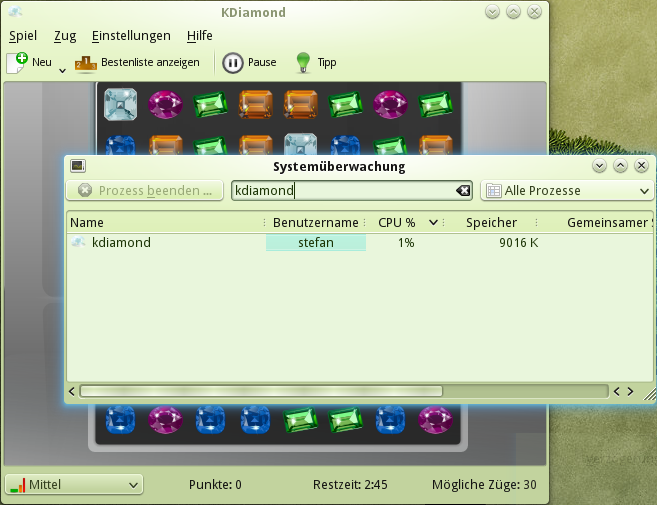 That may not sound much, but it’s already over 7%** of KDiamond’s non-shared memory. To put these numbers into perspective for our fellow developers: The KGameRenderer port of KDiamond actually uses a more complex item graph on its graphics scene (because diamonds are KGameRenderedItems now, which consist of two items internally), so the lower memory consumption comes mostly from clever caching strategies (e.g. by automatically discarding pixmaps generated by intermediate resize events which occur very often during a KXmlGuiWindow initialization). Another optimization which I expected to show up in this measurement is the delayed SVG loading. In fact, KGameRenderer does not load the SVG file at all if the cache is current and contains all needed pixmaps. However, there is no measureable difference in the lower memory consumption in the cold (without disk cache) and the warm start (with disk cache). This could possibly be different for games with complex SVG themes. All in all, assuming that I have time to port enough games*** to KGameRenderer, you can expect 4.6 to be the least resource-intensive release of the kdegames 4.x series. * Yes, I’m not talking about the 4.5 release, that one is basically over for me (modulo maintenance fixes). I’m already deep inside the 4.6 cycle and have started merging my feature branches, with KGameRenderer merge into trunk coming next week, in order to get as much testing as possible before the release. ** The numbers have been measured with KSysGuard and xrestop, and are just there to give you an idea of the dimensions. You probably know that there is no absolutely reliable way to measure memory usage of an application. *** At the moment, there are only ports of KDiamond and KSame. If you read Planet KDE regularly over the course of the last weeks, you know that kdelibs 4.5 comes with the shiny new KSharedDataCache. Michael Pyne explained its purpose and design in a nice series of blog posts. With KDE SC 4.5 coming onto my disk (at least the second Beta), it’s the right time to take advantage of this KSharedDataCache and its sibling KImageCache. 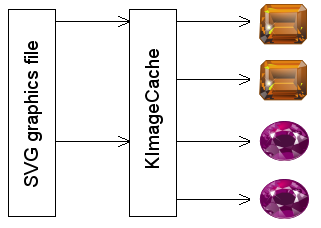 Like many other applications in the kdegames module, KDiamond (your favorite clone of a trade-marked game about assembling rows of jewels) uses the predecessor of KImageCache, which is called KPixmapCache. KPixmapCache is actually working quite well, but there may occur problems when multiple instances of KDiamond are running at the same time. I know that such bugreports are going to appear somewhen (regardless of the abstruseness of this configuration in the context of most of our games), so it’s better to fix these problems by moving to KImageCache. And while we’re at it, this is the right opportunity to rewrite the whole rendering code in KDiamond. What’s the problem after all? Why does a game as simple as KDiamond need a complicated rendering infrastructure? The problem is that its fancy themes are vector graphics (in the SVG format). Simply speaking, vector graphics files are not an image of themselves (i.e. a bunch of pixels, like the bitmap graphics files which your digicam generates), but a bunch of painting instructions like “create a line from here to there”, “draw it with a thick black pen”, “fill this rect with that gradient” which can be used to create the image in question. The advantage of vector graphics is that they can be used at different screen resolutions. But there is a clear disadvantage: Vector graphics are complicated to draw. In the simplest case , a bitmap can be drawn by simply putting the bitmap into the video memory at the right position (“blitting”), while drawing even simple vector graphics involve dozens to hundreds of rendering operations. 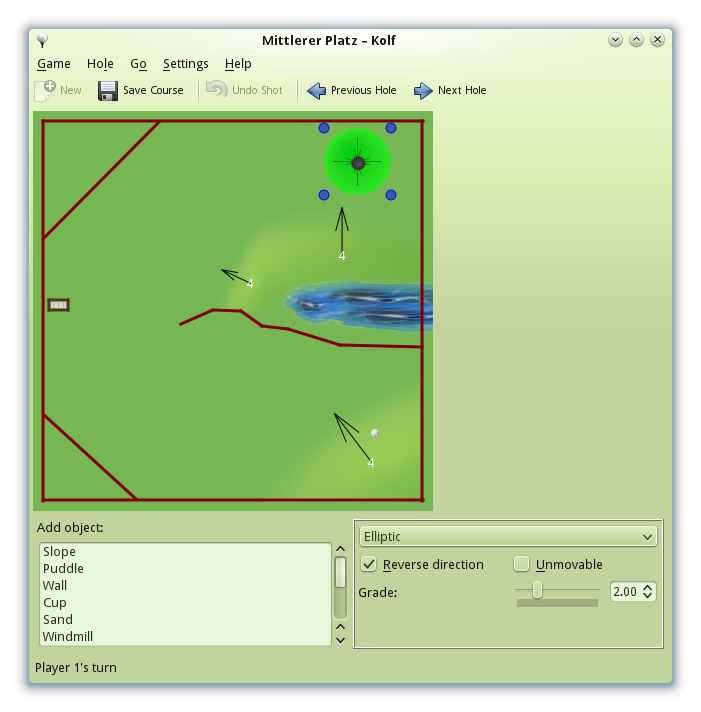 Therefore, most KDE games use some form of pixmap caching: The rendering operations are performed off-screen on a pixmap, which is then put on the screen. This pixmap can be reused, so some games save the pixmaps on the disk using the KPixmapCache (or its successor KImageCache). In the above picture, we see the situation with a KImageCache. 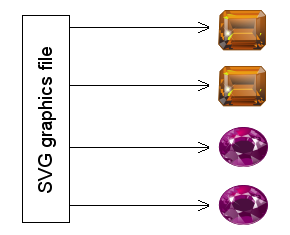 The single game elements (diamonds in this case) need to be rendered from the SVG graphics file only once. Any following requests will reuse the cached images. 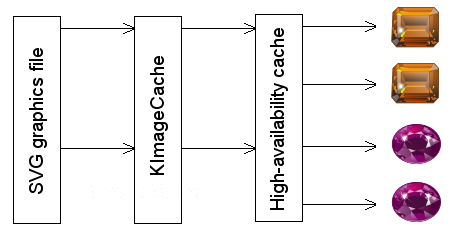 But there is another problem: Using the KImageCache introduces a non-negligible runtime overhead which slows down access to the cached pixmap (i.e. the right arrows, which, as you see, are plenty). I have had a good experience lately with using a second cache inside the application, which is optimised towards serving pixmaps as fast as possible. With this change, KDiamond’s animations are suddenly fluid, especially the explosions when diamonds are removed. These animations consist of multiple images (“frames”) which are shown in fast succession, so there is a high traffic on the cache. While the application is running, these images become available in the high-availability cache and can be served quick enough. With this experience, I am currently building new classes for our libkdegames: KGameRenderer implements theme management (a level higher than the current KGameTheme class), simple management for animated sprites (as in: series of frame images), and the caching strategy outlined above. It is accompanied by a helper class KGameRenderedItem. This is basically a QGraphicsPixmapItem which automatically reacts to theme changes and resizing by fetching suitable pixmaps from the cache. A funny feature of KGameRenderer has been copied from KGoldRunner’s renderer (KGrTheme): If all pixmaps are cached already, the SVG file is not loaded at all. The impact of this optimization is not that high for KDiamond, but it certainly is for applications with many graphical elements, or for complicated themes. Please help with testing! It’s easy! If you’re running a current KDE SC 4.4 snapshot (all packages and self-compiled variants are okay), please compile/install KDiamond from kdegames. Start KDiamond, pause the game after some seconds, and unpause it after some seconds. Please write back (either as a comment to this blog entry, or as a mail to me) what you observe: Normally, pausing should hide all diamonds and display a popup in the top left corner of the board, and after unpausing, you can continue to play the game as usual. But on some systems, the popup will get stuck in the middle of the appearing animation, stay there after unpausing, and the game will not be playable even after the unpausing. 1. Which distribution do you run? Which version? 2. If you compiled your Qt and KDE from sources, which branch of Qt did you use, and when did you update KDE the last time? 3. If you installed your Qt and KDE from packages, which repositories did you use? Update: Thanks to anyone who sent information. I’ve found the root cause of the issue: KStatefulBrush. Silly as it sounds, but usage of KStatefulBrush results in an infinite loop. I’m still puzzled why this problem appeared only for me. The problem is actually a bug in Qt. A long-standing problem in KDiamond was that the lower and right border were thinner than the upper and left one. I finally had a deeper look into this with a special debug theme (big rectangles instead of partly transparent SVG masterpieces) and found that this issue was caused by rounding errors. When converting from a floating-point precision number to an integer numer, the digits after the decimal point are usually cut off. In my case this let all diamonds move to the lower right. The bug is now partially fixed, the rest is virtually invisible. 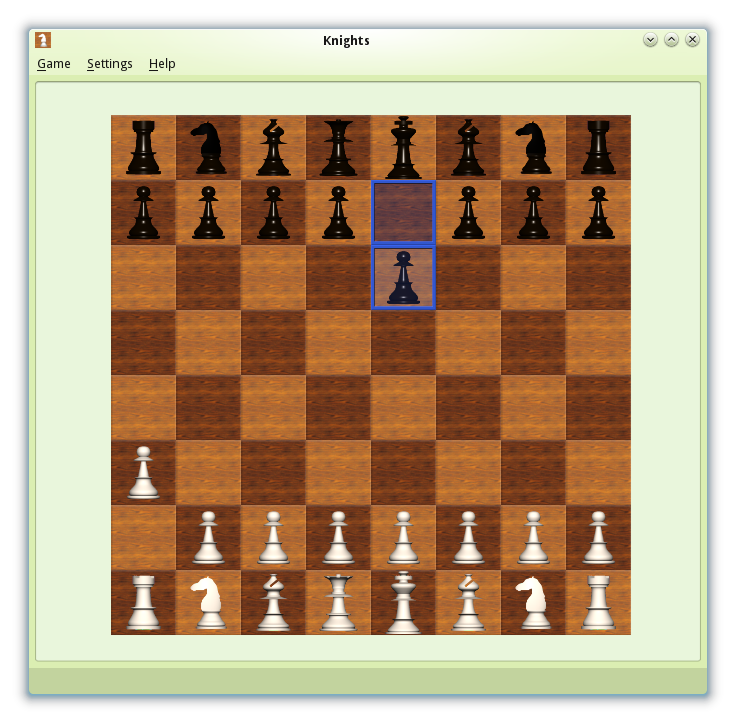 Meanwhile, a friend of mine has started his first KDE application. Palapeli (located in playground/games) is a jigsaw puzzle game. Unlike the normal jigsaw implementations, you do not have to move the pieces from a list onto a fixed board, but can move the parts freely. 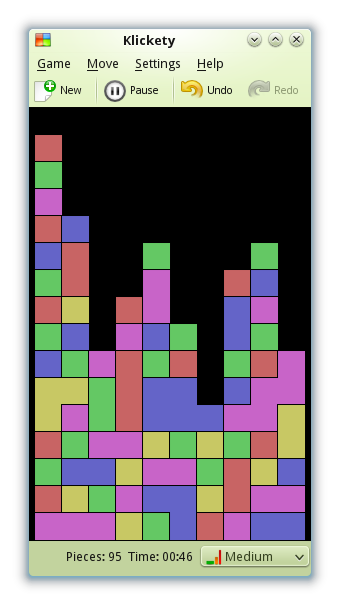 We will release a first preview version once we have loading and saving of puzzles, and a proper “New puzzle” dialog. Right now, there are only some command line arguments, so if you want to try Palapeli, make sure to pass something in the “–image” argument. For any further questions, `palapeli –help` is your friend.